Place-based education – an approach to learning which engages young people in meaningful investigations taking place in their local community – shows great promise in advancing the concept of childhoodnature. Through sustained and thoughtful engagement with the natural and social worlds of which they are a part, young people can be supported in the development of agency, or the ability to make a difference in the world. 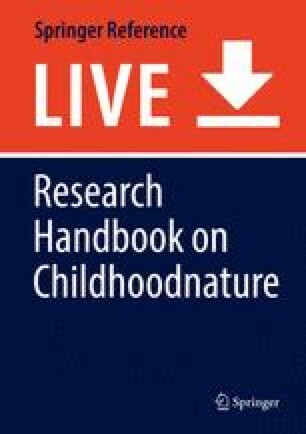 This chapter argues that place-based education projects can best realize this potential by building on culturally and ecologically responsive experiences informed by a fusion of David Greenwood’s framing of place consciousness and Steven Fesmire’s articulation of ecological and moral imagination. Specific program design recommendations are then made to ensure age-appropriate youth leadership of the work, support continuous development of skills and dispositions, nurture interest and commitment through maintaining connection to place, and foster depth of engagement through the enhanced interest that comes about through meaningful participation in the world. PEEC (Place-based Education Evaluation Collaborative). (2010). The benefits of place-based education: A report from the Place-based Education Evaluation Collaborative. Available online at http://tinyurl.com/PEECBrochure. U.S. Department of Defense. (2002). DoD News Briefing – Secretary Rumsfeld and Gen. Myers. Retrieved 27 June 2016 from http://archive.defense.gov/Transcripts/Transcript.aspx?TranscriptID=2636.